Almost two years on from the devastating shooting at the Centre Culturel Islamique de Québec, Canadian Muslims are still reeling from the hatred and horror inflicted upon worshippers that night in Quebec City. The attack of January 29, 2017, claimed the lives of six Muslim men – all fathers, husbands and sons – and gravely injured many others. It was the most horrific largescale expression of the kind of Islamophobia that too many Canadian Muslims face daily. As we approach the second anniversary of the attack, we pause to recognize that the racism and hatred that underpinned this attack do not exist in isolation. According to the latest figures, hate crimes and discrimination against minority groups and Indigenous communities in Canada are on the rise, and four-in-ten of such crimes are violent. Recent attacks against religious, racial and other minorities in Canada have demonstrated beyond any doubt that no one community can combat this hate alone. Rather, as Canadians, we must come together and unite, not only against Islamophobia but against all forms of hate. We had previously called on the government to designate January 29 as a National Day of Remembrance and Action on Islamophobia. 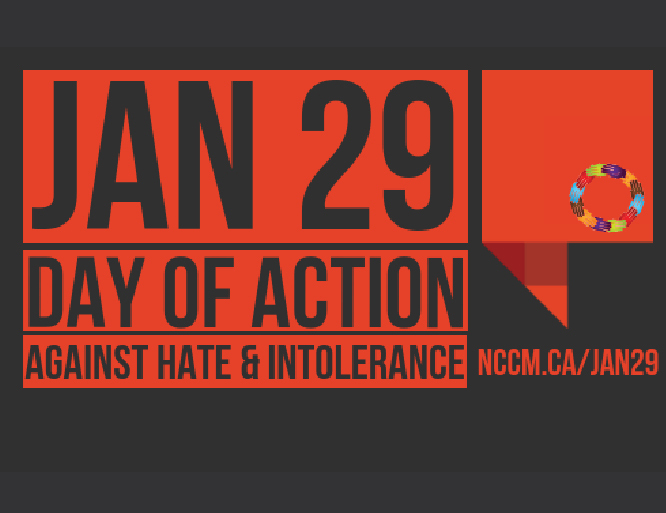 Today, in solidarity with diverse minority communities across the country, the National Council of Canadian Muslims (NCCM) and the undersigned organizations call on our government to designate, by order-in-council or by proclamation, January 29th as a National Day of Action against Hate and Intolerance. The NCCM and all of the undersigned organizations believe that the best way to combat hate and intolerance is to unite against it. This designation will provide a focal point for Canadians -2- P.O. Box 13219, Ottawa, ON, K2K 1X4 tel: 1-866-524-0004 fax: 613-254-9810 email: info@nccm.ca www.nccm.ca from all backgrounds to join together in the fight against Islamophobia and hate of all kinds. Only collectively can we preserve the inclusive nature of the Canada that we all call home.